From time to time we received requests from customers to verify the genuineness of their boards. The post presents a simple method that users can use to do the verification quickly. This method bases on the following facts. 1 ) Each board contains a unique ID which was printed at a sticker on PCB and is displayed each time at the first screen of power-up. 2 ) Each board contains a unique serial number which is also displayed each time at power-up. 2 ) Check whether serial numbers or board ID's are duplicated when you have multiple boards. If they do the boards are likely fake. The photo below shows the method. My mainboard has non-matching numbers look at the pictures . AND , is a " DSO SHEii" !! Last edited by jan on Mon Aug 07, 2017 1:17 pm, edited 1 time in total. It is suggested to request full refund from the seller. If you need any official confirmation of the fake product please contact JYE Tech at jyetech@163.com. Please send photos of the board and power-up screens. Last edited by jan on Mon Aug 07, 2017 1:18 pm, edited 1 time in total. jye1 wrote: It is suggested to request full refund from the seller. If you need any official confirmation of the fake product please contact JYE Tech at jyetech@163.com. Please send photos of the board and power-up screens. I've had this problem and, following your advice, I have asked for a full refund to Aliexpress stating it was a counterfeit. Now Aliexpress is offering me a 20% refund or returning goods and 100% refund, but the latter is not viable for me as the cost of returning exceeds the product cost. 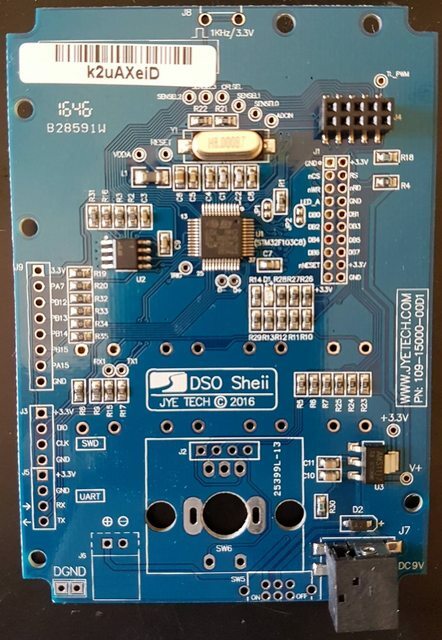 In the advertisement, they say it's a "Orignal Tech DS0150 15001K DSO-SHELL (DSO150)" but, as you can see in the following photos, the PCB seems an exact copy of the authentic item, except for the Sheii (I had previously bought a good one from Gearbest, but they ran out of stock). Aliexpress admits I was sold a "DSO Sheii" instead of "DSO Shell", but they say my counterfeit claim is invalid because "Sellers have distribution of rights this brand", and ask me to "provide clear photos of the items you have received, including a comparison between the fake and original one, and please provide the official inspection statement from the brand owner". The first part has already be done (I provided the same attached photos of the boot screen and sticker with different numbers, and of the "Sheii" logo, and also a link to this thread), but I need your help for the second part. As you asked in your post, I've sent an email to jyetech@163.com, but I'm also posting it here in case it can help others with the same problems. Thank you for reporting the fake product. It looks we didn't receive your email. Please use the following links to download the official statement against the fake authorization which we believe the seller has provided to AliExpress and the official inspection statement about the fake product. Please freely contact JYE Tech at jyetech@163 for any further assistance if required. This seems like an "standard reply" and reaffirms me in the idea they didn't even read the document (they talk about a "video" that never was asked for...). At least, I'm getting a partial refund which (I hope) leaves the fake seller with no benefits, so I encourage others who have had this problem to open a dispute and ask for a full refund, maybe if they submit both documents from the beginning they can succeed, and even if they don't get the full refund they may get a partial one as I did, discouraging fake sellers to continue to do so. I have got in a similar situation on Aliexpress. 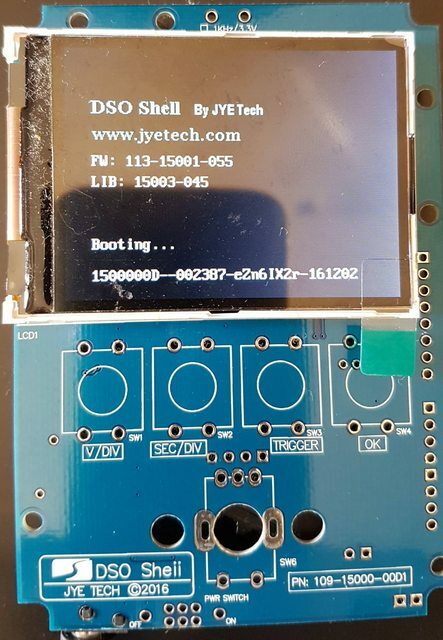 I was motivated that Sunsunsun store declares sales not a DIY KIT as others, but a “Fully Assembled Orignal Tech DS0150 15001K DSO-SHELL (DSO150)”. As a result – I have got counterfeit. When updraded the firmware till the official 062 the device was blocked and became a brick. When I became investigating the situation I found this forum. Unfortunately I have not seen it before, otherwise I would never bought this device. I opened the dispute for a refund, but the seller refused it, saying that JYEtech is his own trademark and shows above mentioned unreadable “sertificate” in Chinese. But the most interesting happened when Aliexpress stepped in the dispute. Aliexpress Judge Team said that I did not provide sufficient evidence of counterfeit goods and therefore no return will be. This despite the fact that I submitted 11 pictures, among which there were photos of my device with fake SN and board ID (mentioned 002387-eZn61X2p), absence of a sticker on the back of the board with ID number. In addition, as an evidence I placed the JYEtech statement with all signs of that fake boards, including the unauthorization of the Sunsunsun store. As well I clarified the evidences by detailed description. But Ali's Judge Team continued to argue that there is NO evidence. All words were similar to above post except they already did not suggested partial refund. Only - no refund. For me it appeared to be sudden and strange. From one side Aliexpress declares that there should be no counterfeit selling on the area, but in fact it protects sellers of counterfeit goods. Probably it could be understood if JYEtech was not Chinese company like Sunsunsun store. But as it is seen Ali protects one company versus the other one despite that other is genuine brand owner. In general, it looks as double standards in Aliexpress. Obviously that very small percentage of buyers can discover the fake and Aliexpress uses this circumstance. I made appeal but no doubt that Ali Judge will protect his conscious position not to see counterfeit. I appreciate help of JYEtech in issuing the Statement, but it looks like it is useless to fight with that giant - Aliexpress. Probably only real Сourt can stop this bacchanalia. Below I attach the pictures of my board before and after installing the firmware. Additionally it is a toy and not a real measuring equipment. No serious lab in the whole world would choose anything else than a Tek. Even the hobbyists - like me - are using older Tektronix devices. Because you need at minimum one device you can fully trust in. I am using - for example - the handy DSO 150 in my garage for car and e-bike repairs. Great idea! I hope Jyetech takes it into consideration. As I said here, I'd be happy to contribute; I'm a frustrated owner of a counterfeited "DSO Sheii", as you can see a few posts above.